Welcome to the Spring/Summer 2017 edition of the Resiliency Reader eNewsletter brought to you by the Al Siebert Resiliency Center. This issue, we're focusing on the personal stories of our two senior Resiliency Facilitators, Glen Fahs, PhD, and Michelle Atlas. Both of them, like all of us, have dealt with challenges on both personal and professional levels. We present them in order to show how life's challenges can be dealt with by moving through the steps of disruptive change and applying the 5-Levels of Resiliency as developed by Al Siebert. If you are interested in having Glen or Michelle or any of our other Certified Resiliency Facilitators come speak to your group or organization, please let us know! As always, we do enjoy providing you with information about resilient people, ideas, and concepts and appreciate your interest, comments, and suggestions. Happy reading and enjoy the rest of your summer. New Feature: Resiliency in the News! A random listing of interesting articles about resiliency found recently on the web. We'd like to hear your story. 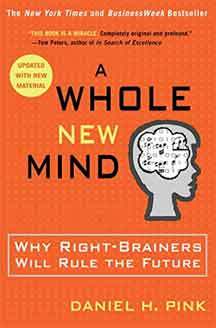 "The future belongs to a different kind of person with a different kind of mind: artists, inventors, storytellers-creative and holistic 'right-brain' thinkers whose abilities mark the fault line between who gets ahead and who doesn't. Soft cover, 304 pages, ISBN: 978-1594481710. ©2006 Riverhead Books. The Resiliency Reader is published by the Al Siebert Resiliency Center.